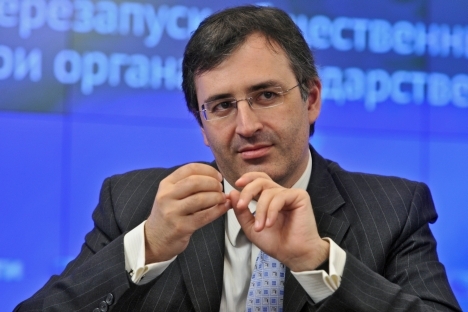 Sergei Guriev received the most votes after the bank said it was ‘too late’ to take his name off the list of candidates. Sergei Guriyev, a top economist who fled Russia after being questioned by investigators over a critical report he co-authored on the 2010 trial of jailed oil tycoon Mikhail Khodorkovsky, has been re-elected to the board of directors of Sberbank, Russia’s biggest bank. Guriyev was re-elected Friday at the bank’s AGM, despite withdrawing his candidacy a few days beforehand. Sberbank CEO German Gref said it was too late to take Guriev’s name off the slate of candidates. In a sign of support from leading businesspeople and economic officials, Guriev received the highest vote of all candidates - including for Gref himself. Gref described Guriev as “very efficient, a great professional, very honest and uncompromising," adding that he was “hopeful” that Guriev could soon return to Moscow. "I just have a personal preference for freedom. My family also deserves to have no fear for me," Guriyev, who also resigned his post as head of Moscow’s New Economic School last week, said in an e-mail from Paris, where he has joined his wife and children in recent weeks. Guriev is starting work as a visiting professor at Paris’s Institut d'Etudes Politiques. Guriyev’s family has lived in France for the past few years. Guriyev has said he left Russia after being interviewed by investigators over a report he and other experts wrote about the second trial of Khodorkovsky, ex-CEO of Yukos, in which they questioned the verdict that Khodorkovsky and his business partner, Platon Lebedev, had embezzled millions of tons of oil from Yukos. Guriev said he took the decision to leave the country after investigators demanded to see his personal and professional e-mails from the last five years, and he feared they were preparing to arrest him as a suspect. In 2005, Khodorkovsky and Lebedev’s first trial saw them sentenced to eight years in jail for fraud and tax evasion. In late 2010, a second trial resulted in a term of 14 years in prison. Their sentences were later reduced to 11 years. In 2011, Guriynewev said in an expert statement to the Kremlin Human Rights Council that Khodorkovsky was not guilty in the second trial. Guriev also stated that he had no conflict of interest with Yukos or Khodorkovsky. Investigative Committee spokesman Vladimir Markin has said investigators were looking into a 2003 donation of $50,000 made to the New Economic School by Khodorkovsky’s Open Russia Foundation, RIA Novosti reported. Guriev has responded that he was on a leave of absence from the university at the time, and denies any conflict of interest.